We know the only barrier for you to travel China alone is language, let us help you get it over, forget about the greedy travel agencies. Pay as low as USD $9.99 per day for a helpful licensed English-speaking tour guide. Pay everything else after you see the actual price. Forget about the fixed unsatisfied itinerary and hotels, change them as you tour further, choose them on spot by yourself. The quotation we give you will be listed on per day per item basis, thus you will know exactly what your cost is made of. For the comfort, or remote regions, sometimes you may need to hire a car. We offer CAR-RENTAL-ONLY service in China with affordable price. In all conditions, a local tour guide is always the one-time solution for you to travel China alone. We offer RENT-GUIDE-ONLY service in China. It’s flexible and money saving. It’s the only key element you need for your private China tours. 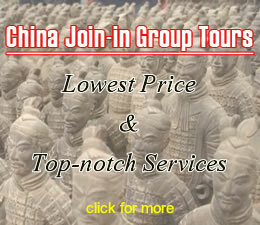 Join our China group tour with lowest price and top-notch service if you are budget traveler. Xiexie Way Wang for being such a caring and helpful guide for my client and friend, Aaron Wong. He told me he had such a wonderful time during his trip to Yunnan. I made a DVD for him from some of his photos and see that you were in them too. I have been so busy trying to edit my digital book to get it ready to sell that I haven't had any extra time to thank you for your excellent guide service, etc. Will write more soon. The driver was reliable, professional and flexible. He made sure to show us how to get to places, buy tickets, where to eat, and pointed out particular landmarks so we could remember where to meet him. He was conscientious and always on time. I have to say, I am very impressed. Confirmation / invoice is very detailed. I'm a very organize and detailed person and didn't see anything that you've missed.